Bill Ide | VOA Jun 11, 2018. BEIJING — China may not be participating directly in the summit between U.S. President Donald Trump and North Korean leader Kim Jong Un, but in some ways Beijing will be the invisible third party in the room. During the roller coaster run-up to the sit down, China has played a significant role. Analysts note Beijing’s participation in expansive international sanctions was a key factor in getting Kim to the negotiating table. Even though, Beijing has tapered off its enforcement in recent months. “China was participating in an unprecedented sanctions regime, very close to embargo, without Chinese participation it would be much less likely that North Korea’s government would’ve agreed to talk,” said Andrei Lankov, director of the Korea Risk Group, a provider of risk analysis, news and information on North Korea. Before Tuesday’s meeting, Xi Jinping met twice with Kim Jong Un. On Monday, China’s Foreign Ministry confirmed that Kim flew to Singapore on an Air China passenger jet. It did not clarify whether Beijing footed the bill, but that it provided the plane at Pyongyang’s request. As North Korea’s biggest trading partner and its closest international ally, the success or failure of the meeting could have lasting consequences for Beijing. “The consequences of significant progress not being made and a rapid escalation in hostility, that’s always an option if this summit doesn’t work,” Neill said. On the surface, Beijing has been a vocal supporter of the meetings and the “pivotal” role they see the talks playing in helping take steps toward ridding the peninsula or nuclear weapons. Beijing denies that it has other intentions. “China has always played a positive and constructive role on North Korea’s nuclear issue. We have no ulterior motives on this,” Foreign Ministry Spokesman Lu Kang said at a recent briefing. “The Chinese have wanted to own the relationship and are probably quite covetous over the idea of the United States running roughshod over the initiatives they have pursued such as a removal of U.S. forces or reduction in joint exercises between the ROK [South Korea] and the U.S.,” Neill said. Lankov, who is also a professor of Korean history at Kookmin University in Seoul, said what China wants is the status quo: it doesn’t want war on the peninsula, revolution or unification where South Korea is the dominant player. “China wants to have stability in the region, not because China is such a nice country, but because any conceivable change or separation in or around the Korean peninsula will damage China’s interests,” he said. What Beijing also wants is recognition and to play a prominent in any efforts to denuclearize the peninsula. 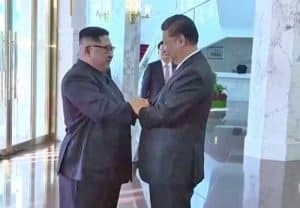 Beijing has paid particular attention to talk that South Korea and the United States could together with North Korea sign a peace agreement without China. “The two countries may try to confuse abolishing the 1953 armistice with the so-called declaration,” he added.